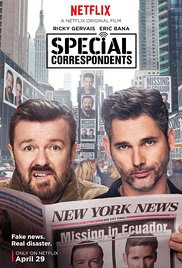 The concept at the heart of “Special Correspondents” isn’t a bad one. A radio news reporter and a sound technician stay safely in New York while delivering fake news reports on a war that has broken out in Ecuador, rather than traveling into dangerous territory. The concept is full of potential for commentary on news reporting both for dramatic and comedic effect, yet Gervais doesn’t deliver on either. It begins with charming, debonair reporter Frank Bonneville (Eric Bana) lying about his identity in order to get into a crime scene so he can be the first to deliver the story. The obvious logical lapse here being that neither his fame nor his past run ins with the police at various crime scenes (for the sake of the story) seem to give him away. Yet this becomes just one of many lapses in logic we are forced to forgive. Eventually they become too numerous to ignore, especially when the rest of the film doesn’t do enough engage us. Nevertheless his deception establishes Frank as a man willing to do anything for the story. The irony is that at first he lies to get the real story, but later without any question of the moral implications, he lies to tell a fake story. His boss doesn’t approve of his methods, and it’s clear he’s on thin ice. Nevertheless, Frank is given strict instructions to catch a plane for Ecuador after news of war breaks out. Enter Ian Finch (Ricky Gervais) a sound technician tasked with accompanying Frank to Ecuador. He’s broken hearted over his failing marriage with his wife Eleanor (Vera Farmiga), a selfish person that’s hard to imagine ever wanting to marry Ian in the first place. She clearly values money and stardom over anything else, and she resents Ian for never becoming more than a radio station technician. As they head to the airport Ian, ever the klutz, loses their tickets along with their money and passports. Fearing for their jobs they decide the show must go on, even if they aren’t able to get to Ecuador. They setup their equipment across the street from the station in the upstairs room of a small restaurant owned by two friendly but dumb clichés played by America Ferrera and Raúl Castillo. Everything goes along without a hitch until they realize that eventually they’ll have to “get out of Ecuador,” and that gets harder when the powers that be suddenly want to evacuate them and they still aren't there in need of evacuation. Their plan involves faking their own capture, and eventually finding the money to sneak their way into Ecuador (causing me to wonder why they didn’t just start with that part). To get the money they steal from Eleanor, who has found a way to turn the situation into self promotion. That self promotion is so abundantly obvious that it’s irritating that no one other than Ian seems to realize what she’s doing. The latter portion of the film goes from boring to off the rails including an incredibly unlikely shootout and a bit of random praise for Ian that starts to feel like exactly the sort of self promotion for Gervais that villainizes Eleanor earlier in the film. There’s simply no clear direction as to what this film should be. There are shades of classic buddy comedies here, and a very underdeveloped romantic comedy, and a lot of missed opportunities for both comedic commentary about news reporting and dramatic moral quandaries about dishonest news reporting. The fact that they aren’t made to deal with any of their dishonesties feels like exactly the sort of mistake lesser films make. There is also a missed opportunities to explore the idea of a spouse making money off her 15 minutes of fame due to the tragedy that has endangered her husband, but little comes of it. It all boils down to the fact that there are several films going on at once here, and all of them would have been better in the hands of a better screenwriter/director. Ricky Gervais may come up with some good characters, but this film is a case for why he should leave the screenplay writing to better story writers. The concept at the heart of this film is interesting, but Gervais didn’t have three dimensional characters or a full fledged script to work with. There is nothing particularly engaging about the story, and these two dimensional characters lack compelling story arcs. And as for the humor, what surprisingly little there is, it falls well short of Gervais’ better work.